12.5" RCOS @ ~f/9 (2880 mm fl) 0.643 arcsec / pixel. Zoomify image scale is 0.96 to 2.88 arcsec / pixel. 12/19/2009 to 12/24/2009 Chino Valley, AZ... with CCDAutoPilot3 & CCDSoft. eXcalibrator for (b-v) color calibration, using 9 stars from the NOMAD1 database. CCDStack to calibrate, register, normalize, data reject, combine the sub exposures & LRGB color. NGC1961 is disturbed galaxy, about 171 million light-year from Earth, toward the constellation Camelopardalis. Its unusual asymmetric appearance has also earned it a spot in Arp's Catalog of Peculiar Galaxies as number 184. 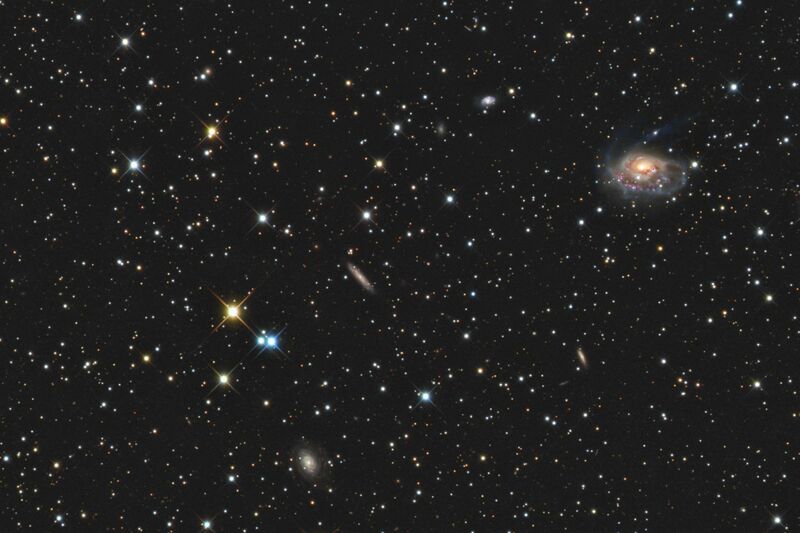 Given the galaxy's apparent size and brightness, it is one of the largest in our local area of the universe. The cause of NGC1961's peculiar appearance remains unsolved as there are no nearby galaxies large enough for gravitational interaction create the distortion. It is possible that the odd shape is the result of a past merger with another galaxy.